Unlike the palm lines, the fingerprints do not change their patterns over time. Unlike the palm lines, the fingerprints to not change their patterns over time. By comparing the prints of two different people, you can see how their personalities will usually interact. 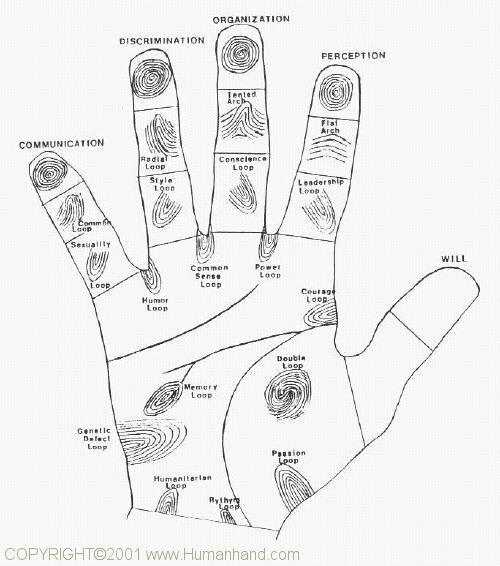 If you don't know which fingerprint patters are which, I'd recommend reading Fingerprints & Palmar Dermatoglyphics, by Edward D. Campbell, and you can also view this image. If there is any question about what fingerprint pattern you are looking at, then use the tri-radius at the base to determine the exact type of print. Two tri-radii is a whorl or double loop (composite), no tri-radius is an arch, one tri-radius on the thumb side is a loop, and one tri-radius on the baby finger side is a radial loop. The index finger relates to the expression of both Ego and hierarchal authority. It also represents our perceptions, and the physical realm. Career matters are shown on the index finger, and this fingerprint can identify a person's basic approach to professional relationships. Whorl - Career is an important area of focus in your life. You do best at work when you are in a position of authority, and can "take the job home with you" each night. Arch - You have rather traditional values about work and career, and do best in a work environment where there is an opportunity for step-by-step promotions within the organization. Loop - You take your job less seriously than others, and do best when your work is restricted to just business hours. You need to be able to forget about work as soon as your shift is done for the day. Radial Loop - Your need is to be self-employed, or fully autonomous in your work. You do things in your own unique way, and no one tells you what to do (at least not successfully). Double Loop - Like the whorled print, career is an area of focus in your life. You tend to be rather passive about career advancement, however, often allowing time and other circumstances to make many choices for you. Whether it's real or just your rationalizations, Fate always plays a major part in your career choices. Whorl - You respect and appreciate their devotion to work and career advancement. There may be regular disagreements over whose job is more important (and thus takes priority), or whose idea is better. Arch - You're fine as long as you're the one giving the orders - You know they are dependable. Their reliance on seniority or hierarchal authority can be irritating, however, because you feel that others (such as yourself) can often do a better job. Loop - You lead, they follow. They may be uncomfortable with your determination, and also with your ability to know every time that they are lying to you. Radial Loop - You appreciate their creativity and initiative, but their insistance on doing things their own way can be frustrating. And do they really believe that you can't tell when they lie to you? Double Loop - You see their potential for career advancement, but their committment seems lacking. They can become argumentative or rebellious when you insist on things being done your way. Whorl - They seem to be a born manager or executive, but they also appear unwilling to put in enough time to "pay their dues". They appear to have little respect for the chain-of-command, which gets annoying. To you it can seem unnatural how they respect the person, but not the position. Arch - It's comforting how you both do things the right way - the traditional, tried-and-true, by-the-book method. Loop - They appear to find every new task easy, which can make you feel slow or inadequate (until you see their finished results, that is). Their frequent disregard for traditional wisdom seems immature and foolish. Radial Loop - Their unique creativity and inventiveness is a tremendous asset to you. Their inconsistency, often irreverent behaviour, and refusal to take direction is somewhat aggravating (to say the least). Double Loop - Their tremendous career potential is obvious, yet they cannot seem to stay with one organization long enough to attain a worthy leadership position. Whorl - They lead, you follow. Their ability to know every time that you try to deceive them can make you very uncomfortable, and they take their job WAY too seriously. Arch - They are dependable and by-the-book, yet they need to teach and learn everything so slowly that it can become boring. Loop - You both share an easygoing and fun approach to work and career - Neither one of you takes the job too seriously, and you both enjoy discussing recreation and hobbies. Radial Loop - They are great to work for, or to work with - Their enthusiasm and spirit of adventurous makes your work much more enjoyable. They bring variety and innovation to the workplace. It can at times be uncomfortable how skillfully they can deceive or lie to you when they wish to. Double Loop - Depending entirely on their mood that day, it's either fun and excitement at work, or a long and boring day. You feel that their advice can almost always be trusted, even when you don't like what they have to say. Whorl - You respect their ambition and long work hours. You both also value truth, and are hard to deceive. The frustration comes from how they believe they understand your innovative ideas, when they really haven't got a clue. They also appear rather self-centered much of the time. Arch - You like the fact that you always know where you stand with them - They are consistant and predictable at work. On the down side, they seem to learn new tasks slowly, and slowing down is a nuisance for you. Loop - You lead, they follow. You both share an enthusiasm and adventurous spirit, yet the two of you approach life very differently. They are rather gullible at times, and seem to lack self-direction or purpose. Radial Loop - You can relax and be yourself, because they understand what it is to be such a "Maverick". Since you both have unique and innovative ideas, however, you can rarely agree on what action to take. Double Loop - You can predict the actions of just about everyone except them. Just when you've got them figured out, they change yet again. You enjoy how you can feel their acknowledgement and deep appreciation for your innovative ideas. They have the annoying habit of making a single decision or action that thwarts one of your ideas (yet it turns out that these ideas were best left undeveloped). Whorl - For better or for worse, they set the tone for your work environment more than anyone else. You cannot really help but to follow their lead. They can be rather dictatorial at times, and disregard some of your best ideas. Loop - They are fun and friendly, yet unpredictable. It seems that their judgement and advice cannot usually be trusted. Radial Loop - Their spontaneous personality and creative drive is exhilarating, but can also seem very detached from your own personal interests. Double Loop - They are easy and comfortable to work with, but they do tend to focus excessively on their own daily issues and problems.